I finally got round to posting again on my blog - it's been a while! I've been busy with other things recently, although the photography hasn't suffered because of it - I've got stacks of new images to get through and they will be uploaded soon on ashleycorr.com. Just a quick update on the Mute Swans that were nesting at nearby Rainton Meadows, Houghton le Spring. After visiting the nest site a few weeks ago I saw a clutch of six eggs, but for reasons unknown only two eggs actually hatched. Whether the nest had been robbed at some point or predators had possibly destroyed the other eggs, who knows. I managed to get over to the site shortly after the two remaining eggs had hatched and here are a couple of photographs from my visit. 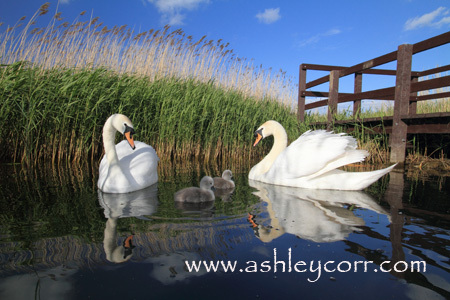 Both the Cobb and Hen were present as the new cygnets took their maiden voyage on one of the ponds at Rainton Meadows. I didn't get too close however as both parents made it clear upon my arrival that they weren't gonna tolerate any arseing about on my part. Of course the bread came in very handy - the key to those close-up photographs. Weather was fine. Plenty of sun and blue sky. Just the ticket. The birds were literally a couple of feet away from me as I photographed them, with the Cobb guarding them closely as I worked. I made sure not to move around quickly as any sudden movement is usually met with disapproval from both parent swans and if I pushed my luck I was going to get a dig of some sort. Didn't want that did I. 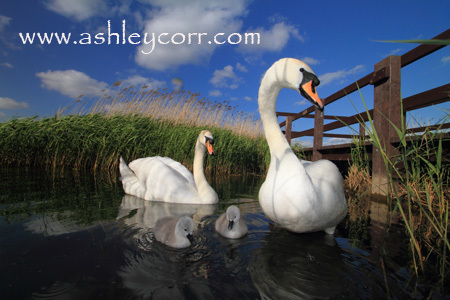 Two nights later I was photographing another fam ily of Mute Swans at Herrington Park near Penshaw Monument. There were seven chicks at this location and they looked approximately ten days old. They must have been fed heavily by visitors to the park earlier in the day as they weren't interested in a feed, preferring to doze off at the waters edge, making photography a bit of a non-starter. I was sat roughly six feet away from them but they just didn't want to know. I normally photograph Mute Swans a lot during the breeding season but 2011 has seen me concentrate more on landscape shots that I had pre-planned earlier in the year. I've also had one or two other things on the go so my nature photography in general has taken a back seat of late. Never mind, there's always next year. I keep toying with the idea of buying a full-on telephoto lens, possibly 500mm, maybe 600mm, but the asking price always puts me off. To me, this type of kit is a must for nature photography, especially birds. I'll stick to landscape photography for now. I'll be back soon with some photographs and write-up's, including Local Landscapes, Local Landmarks and Live Music Photography. There's also some new 'On Location' shots to come, in the shape of my recent visit to Italy. I photographed the unique city of Venice, plus Verona and Lake Garda...COMING SOON!